In the cover of night in 1989, Arturo Di Modica installed his bronze statue Charging Bull at Bowling Green in Lower Manhattan’s Financial District. He had been working at it since shortly after the stock market crash some two years prior. It was a symbol of power and resilience. He did not have a permit, and the authorities were called to remove the work, but the popularity of the statue – and the story of a guerrilla public art installation near Wall Street – saved the bull. Now, 30 years later, the statue is once again part of one of New York’s biggest art controversies. Over the past month, Fearless Girl and its champions have become an adversary to Charging Bull and Di Modica, who claims that its placement infringes on his moral and legal rights as a visual artist. 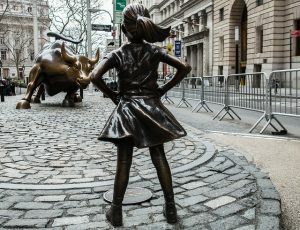 He argues that Fearless Girl derives much of its purpose from Charging Bull and that its juxtaposition changes the meaning of his 30-year-old work, from a “symbol of prosperity and for strength” to a threatening figure. Public history doesn’t exist in a vacuum; nor does public art. Charging Bull’s 1989 installation created meaning from its surroundings in Wall Street and its context following the market crash. Fearless Girl’s juxtaposition to Charging Bull is especially marked through its soft, non-belligerent characteristics; the commission specified that the sculpture was to be of an innocent, small girl, rather than an empowered adult female. In addition to taking its meaning from the juxtaposition to Charging Bull, Fearless Girl is reliant upon the patriarchal late-stage capitalism that people believe it is in opposition to. Because of these factors, Charging Bull now appears menacing and aggressive, rather than strong and spirited. This is hardly the first time that a work of public art has been recontextualized. The most well known case in Canada, Snow v. Eaton Centre Ltd. saw sculptor Michael Snow take on Toronto’s Eaton Centre on such an issue. The shopping mall commissioned Snow’s Flightstop in their atrium. During the 1981 Christmas season, Eaton Centre workers placed festive red ribbons around the necks of the geese. Snow brought action against the company, arguing that the sculpture’s integrity had been distorted, in part because the ribbons implied that it was a decorative work, rather than a piece of art. The Ontario High Court of Justice ruled in Snow’s favour, setting a new standard for moral rights infringement in the country. According to intellectual property experts Catherine Lovrics and Tamara Céline Winegust, in Canada, there is a distinction between distorting the work and its context, which is crucial in judicial decisions of this type. Indeed, there have been more nuanced interactions with public art and their sites, too. As Tonya Davidson traces in her recent article “Mica, Pedagogy, and Defacement”, Ottawa’s National War Memorial has, over the past three decades, been a site of both government and public intervention. The 2006 public urination incident and recurring acts of skateboard are popularly understood as acts of defacement, while the 2006 installation of the Valiants Memorial and the 2008 “Vigil Project”, as well as ongoing commemorative events, have been carefully planned and executed pageants, perpetuating national narratives. Davidson argues that these instances become opportunities to “learn about” as well as “learn from.” Whereas “learning about” affords a distance to the viewer — they take the object in through a discrete set of facts — in “learning from”, the viewer recognizes their inability to be reflected in the memorial but nevertheless takes in the experience. Unlike the federal government’s additions to and programming of the National War Memorial, State Street Global Advisors is accountable to its shareholders. 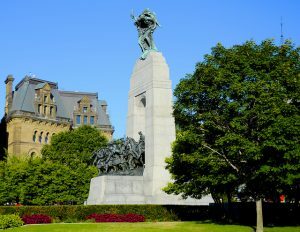 Public art has often been used for political ends, a motive that could be extended to the unveiling of the National War Memorial on the eve of the Second World War. However, Fearless Girl is a rare example of public art being used for corporate objectives. In March, SHE, the exchange-traded fund received more than $3 million in new investor inflows, or double what it acquired the previous month. As much as the champions of Fearless Girl would like us to, it is difficult to set aside the corporate feminism being hawked by its patrons – a feminism that is more concerned with branding and with being inoffensive than creating actual change – or to forget that this piece of public art was commissioned by an advisory group whose parent company had recently paid more than $64 million in fraud charges. Davidson also argues that monuments enable “constellations of learning opportunities” and that the same elements that make a monument affective also make it vulnerable. This is possible because public art and commemorative works operate as a collection of their material and intangible components. We can understand the work of Charging Bull not only through its interaction with Fearless Girl, but also within its historical and contemporary political context, as well as its interactions with the public. Moreover, with the added context of Fearless Girl, commissioned, in part, as an advertisement for capitalism, a new layer is added. Ironically, Di Modica’s stubborn resistance to the placement of Fearless Girl repositions Charging Bull as strong in the face of capitalism, challenging State Street Global Advisors’ commission. Judging by the flocks of tourists to the site, it appears as though the meaning of Fearless Girl may transcend its original intention, an advertisement, as it should: Every person has the moral right to their own response to a work of art. While there are some who applaud the existence of the young girl in the face of what they view as patriarchal capitalism, there are still others, responding to Di Modica’s objections, who may continue to interpret Charging Bull closer to the artist’s intent — a rebellious piece of art that demonstrates strength, which may even be renewed in the face of the capitalism worn by Fearless Girl. Kaitlin Wainwright is the Director of Programming at Heritage Toronto and a graduate of Carleton University’s Public History program. For an age-based analysis of this and other representations of female empowerment, see Tolentino, Jia (April 6, 2017), “The Infantilizating Ways We Talks About Women’s Ambition”, New Yorker. http://www.newyorker.com/books/page-turner/the-infantilizing-ways-we-talk-about-womens-ambition. Tonya Davidson, “Mica, Pedagogy, and Defacement: Learning from Canada’s National War Memorial” The Public Historian (Vol. 38, No. 2), 43.